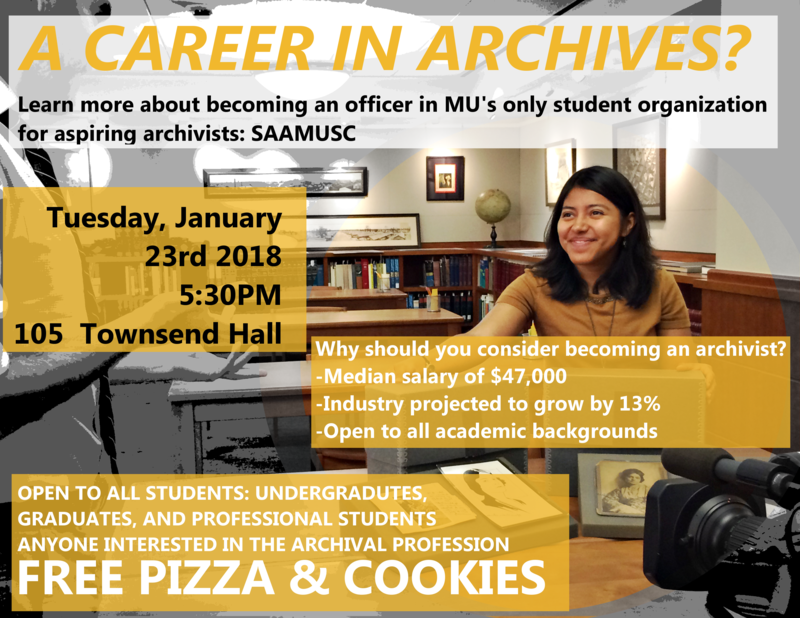 Established in Dec 2016, SAAMUSC builds a learning community and provides professional development and networking opportunities for students interested in the archival profession! 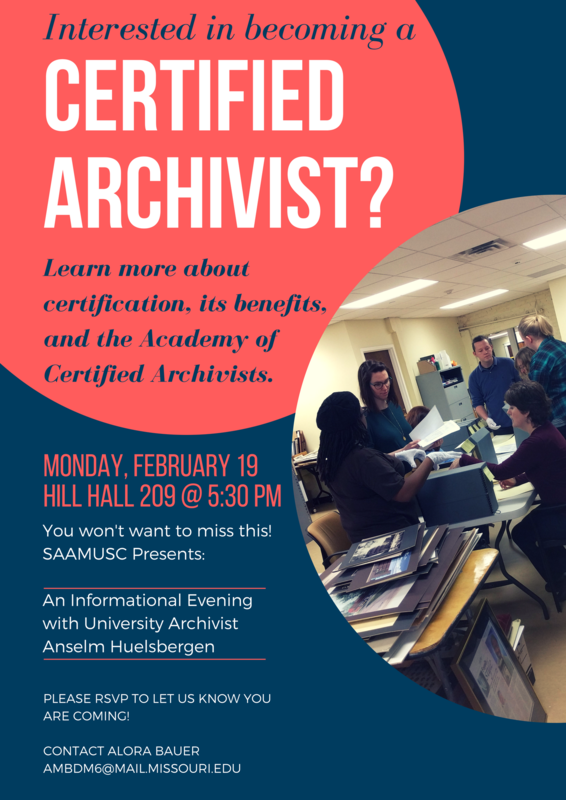 As a Student Chapter of the Society of American Archivists (SAA) we serve to introduce new archivists into the profession, promote communication among student members nationwide, and ultimately develop leaders of tomorrow’s archives profession. 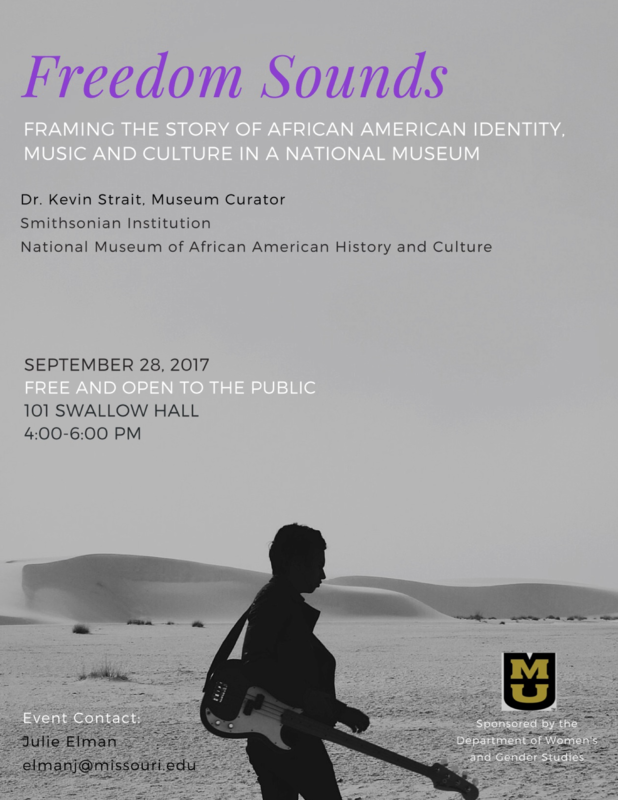 We organize activities and events related to archives on Mizzou’s campus and in Missouri. 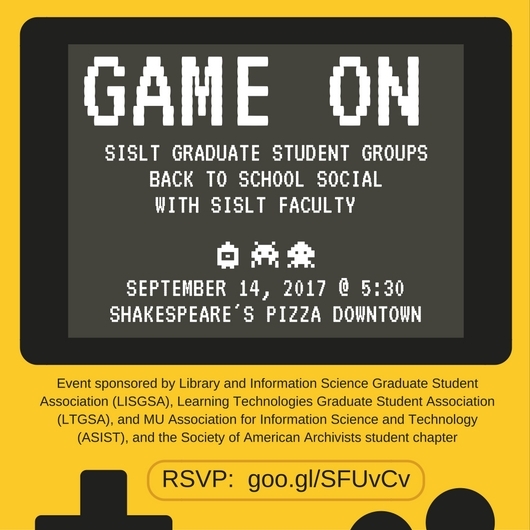 Our officers coordinate event planning in collaboration with SISLT student organizations LISGSA, the ASIS&T Student Chapter, and the Learning Technologies GSA, among others at MU. Below are some descriptive summaries! More details are in our Annual Reports below. SAAMUSC members attended the Missouri Association for Museums & Archives (MAMA) conference in Jefferson City. 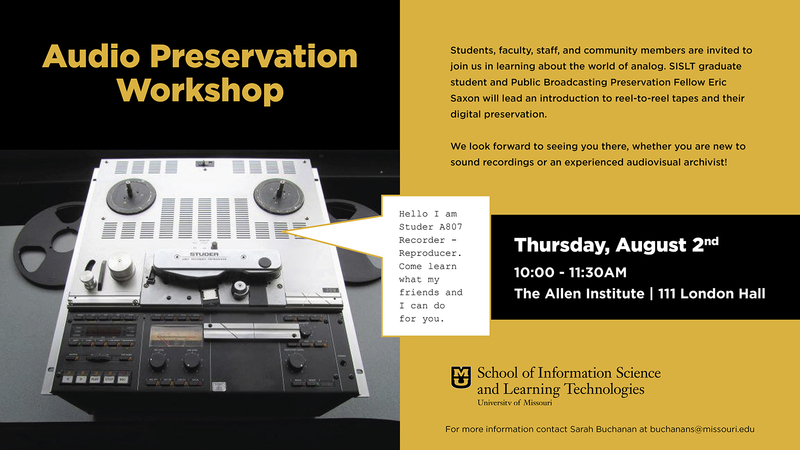 MLIS student and PBPF Fellow Eric Saxon led an Audio Preservation Workshop for the SAAMUSC community. Eric, Fellow Rebecca Benson, and Dr. Buchanan later co-presented a poster at the 2018 SAA Research Forum and spoke at the AMIS / VMS / VMCAS joint meeting about the Fellowship while attending the SAA / CoSA / NAGARA Joint Annual Meeting in Washington, D.C. Dr. Buchanan also co-presented with colleagues at Digital Preservation 2018. Finally, cohort members presented a poster at AMIA on November 30 in Portland, OR. The MU College of Education celebrated its 150th Anniversary with a timeline, among other items. 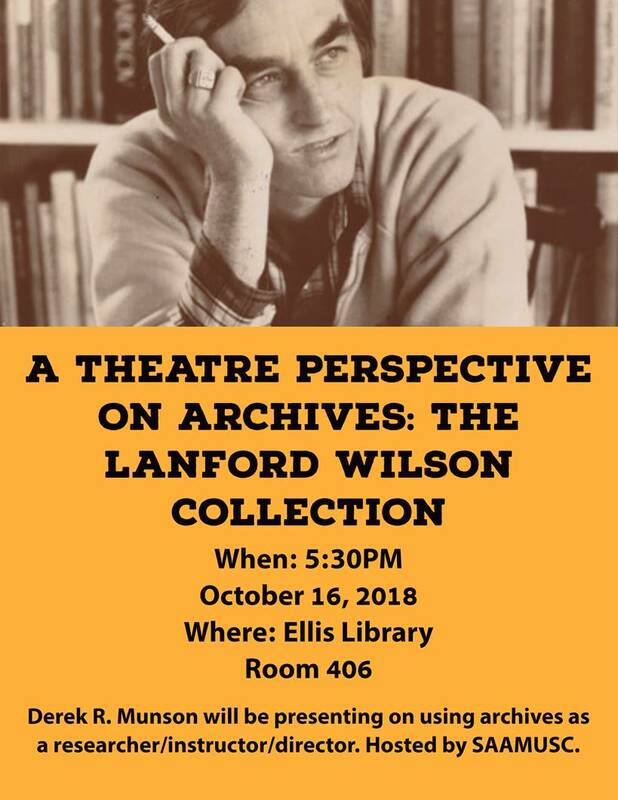 It features several individuals from SISLT’s and the LIS Program’s institutional memory whom graduate students in Archival Practice continue to research in depth. We visited the Harry S. Truman Presidential Library in Independence and heard about audiovisual digitization and education! 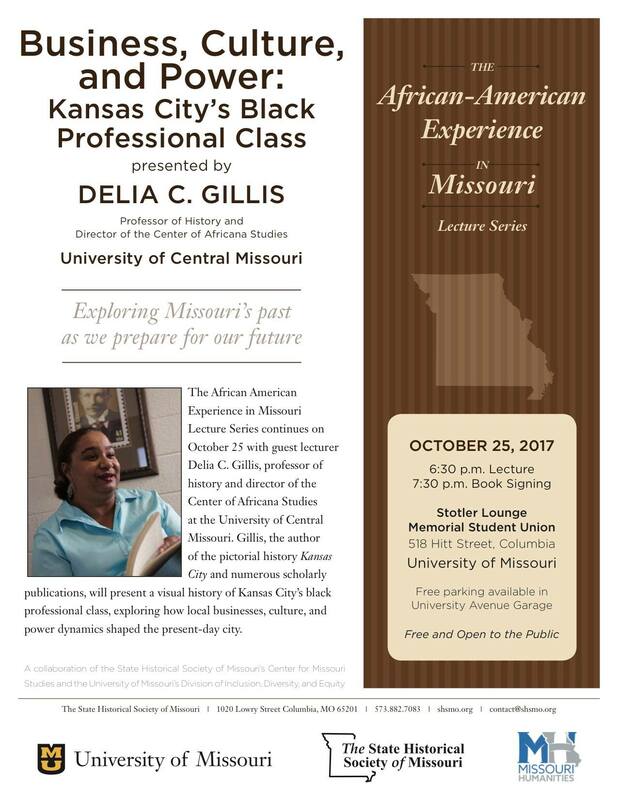 Also this semester there were fascinating talks given by Dr. Delia C. Gillis and Dr. Kevin Strait on campus, the KCAA Fall Symposium (notes by Tamara Inge), and a Cultural Heritage Workshop by Missouri Humanities Council. Several SAAMUSC members attended the Missouri Association for Museums & Archives (MAMA) conference in Kirksville. Check out the local news feature! The Archival Educators Section panel meeting at SAA 2017 featured SAAMUSC President Jennifer Walker and Dr. Buchanan discussing the experience of SAA’s newest student chapter. Today the SAAMUSC had its first event as an official organization. 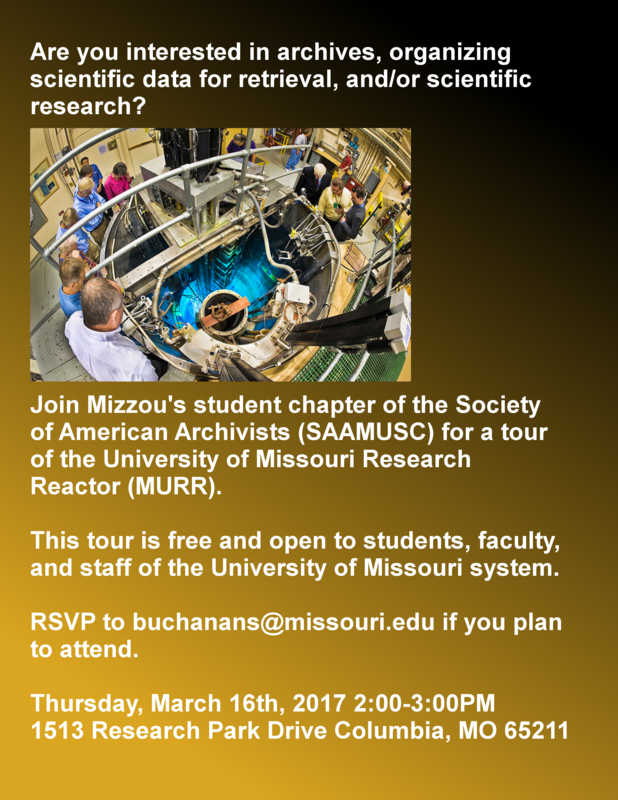 We toured the MU Research Reactor (MURR). Tamara Inge, also an SAAMUSC member, coordinated the tour and is an archivist at the MURR. She and our tour guide Mark Beary led us around the facility, provided a technical overview of the reactor, the history of the facility, and defined some nuclear lingo. MURR is currently the most powerful university research nuclear reactor in the nation, producing 10mW of electricity, though power production is not its main aim. In addition to enabling UM research from various disciplines, the MURR also produces a variety of products for nuclear pharmacuetical applications. David Merz (President), Logan Thompson (Vice President), Sarah Gabriel (Secretary), & Ethan Atwell (Treasurer). Prof. Sarah Buchanan is Faculty Advisor. Rebecca Benson (President), Elizabeth Winter (Vice President), Alisa Pappas (Secretary), Melody Edwards (Treasurer), Brian Flanagin (Communication Chair), & Hali Allen + Jennifer Walker (Programming Co-Chairs). Prof. Sarah Buchanan is Faculty Advisor. Annual Report, for May 31, 2019. Jennifer Walker (President), Alora Bauer (Vice President), Erin Niederberger (Secretary), Brian Flanagin + Dylan Martin (Treasurer), Katie Wibbenmeyer (LISGSA Liaison), & Dylan Martin (Communication Chair). Prof. Sarah Buchanan is Faculty Advisor. Annual Report, for May 31, 2018. Annual Report, for May 31, 2017. SAAMUSC Constitution 20170218. SAAMUSC Constitution 201810. In sum, we attended an info session on 1/24 and 4/17, applied for recognition by the MU ORG Office on 2/20 (approved! on 3/23), voted on officers from Mar 6-9, seated our elected, inaugural officers on Mon Mar 13, and submitted our materials to SAA Council for consideration at their May 16-17, 2017 meeting (chartered! on 5/16). We welcome you to join us in SAAMUSC! As stated in our Constitution, membership is open to any currently enrolled student or employee of the University of Missouri. All individual SAA members in good standing shall also be eligible for membership in SAAMUSC. Alumni of any SISLT program are welcome to attend our events and meetings. Join SAA as a student or individual member! In addition to an archives and records management specialization (of archives courses) within the LIS master’s program, students complete a Practicum. SAA represents more than 6,200 professional archivists employed by governments, universities, businesses, libraries, and historical organizations nationally! 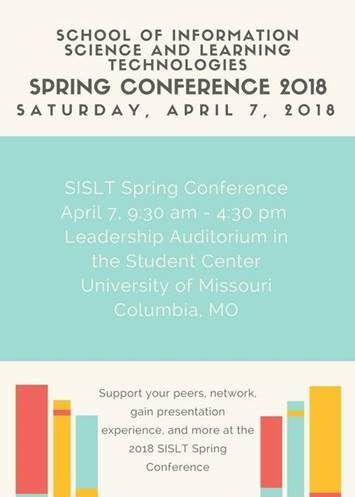 SISLT offers Conference Travel Support for master’s and doctoral students to present at both local and national conferences. The School of Information Science & Learning Technologies is a member of the iSchools organization. The SAA Career Center hosts job postings and career learning resources, and for more see ArchivesGig. Missouri is home to the NARA Kansas City branch, the NPRC in St. Louis, and the Harry S. Truman Presidential Library. SAA’s 45 Sections invite you to contribute to professional initiatives. In particular the Students and New Archives Professionals [SNAP] Section hosts several resources including Student Chapter meetups at the Annual Meetings. 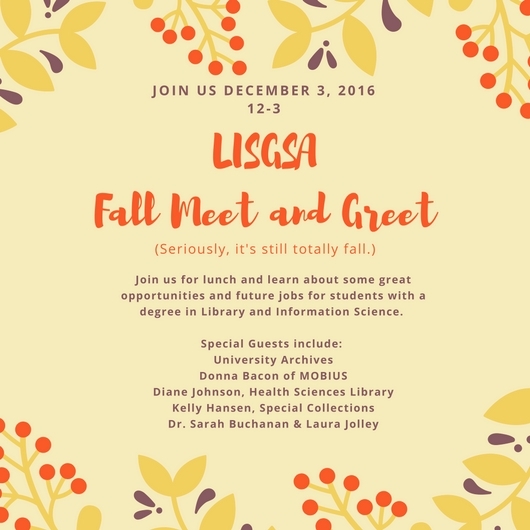 We aim to collaborate closely with the Missouri Association for Museums & Archives [MAMA], which hosts an Annual Meeting in October. SAA’s Regional Archival Associations Consortium [RAAC] facilitates information exchange between archives organizations across America. 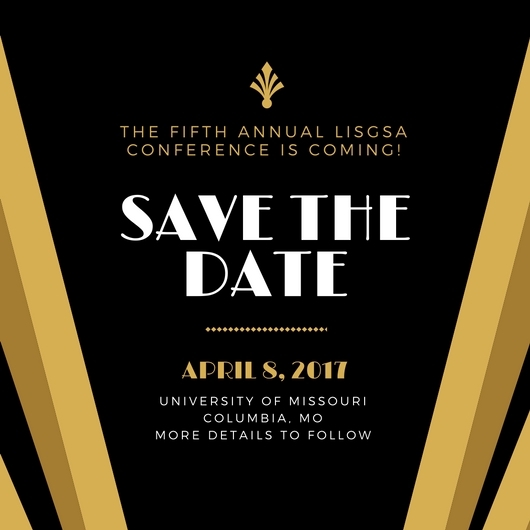 Students may also find the Midwest Archives Conference [MAC], Kansas City Area Archivists [KCAA], and Association of St. Louis Area Archivists [ASLAA] helpful. See more topical resources compiled by peers at the Rutgers student organization. SISLT graduate courses in the Archives and Records Management specialization adhere to the SAA Guidelines for a Graduate Program in Archival Studies [GPAS]. The Library and Information Science program at Mizzou celebrates its 50th anniversary in 2016-17. We launched our celebration at the SISLT Reception, MLA 2016. 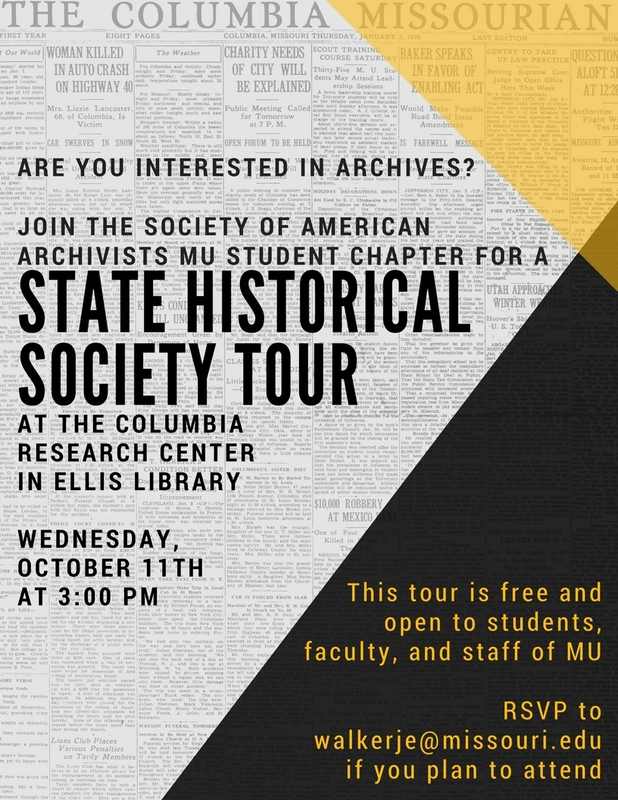 Archival institutions on Mizzou’s campus include the University Archives, the State Historical Society of Missouri in Columbia, and the UM System Records Management Office, among others!